Magic Leap One Creator Edition mixed reality (MR) goggles announced. Magic Leap today finally announced its first mixed reality (MR) goggles, the Magic Leap One Creator Edition. CEO of Magic Leap Rony Abovitz announced that its Magic Leap One Creator Edition goggles will start shipping in 2018. Magic Leap One is built for creators who want to change how we experience the world. 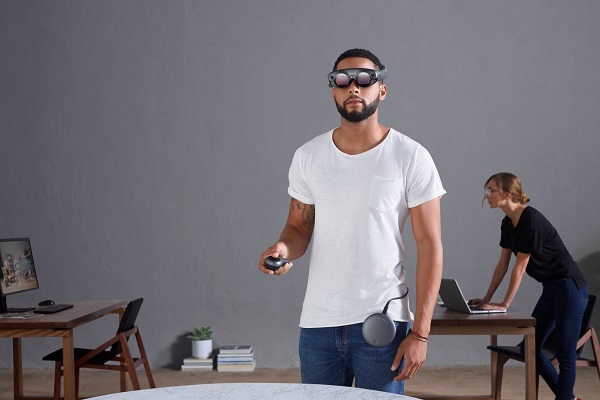 The Magic Leap One consists of Lightwear goggles, a Lightpack processing unit that can be clipped to a belt or pocket, and Control, a six-degrees-of-freedom handheld controller with haptic feedback. Engineered to be lightweight and comfortable for hours of exploration. Magic Leap combined its Digital Lightfield technology with environment mapping, precision tracking and soundfield audio to produce amazing experiences that feel natural. The engine that drives our spatial computing platform. High-powered processing and graphics, streamlined in a lightweight pack that stays right by your side. Force control and haptic feedback allow for a fluid, sensory experience. With six degrees of freedom, movement feels smooth, intuitive and responds to your every gesture. Pricing and the exact shipping date haven't been given yet for the Magic Leap One, but the company says that it will ship in 2018.